This thing will carry canoes, kayaks, ladders and lumber as advertised. 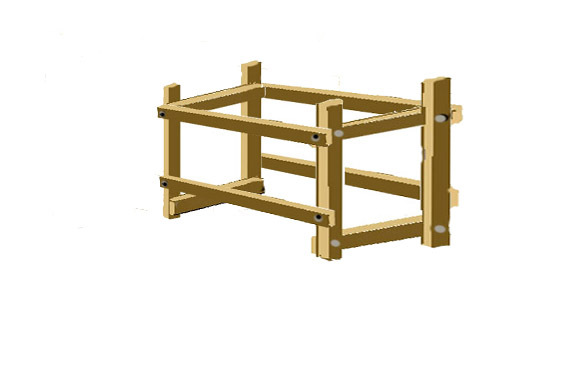 It will also haul pipe or posts and gives you something to tie bottles of welding gas or oxygen to so that it doesn't fall over. Here's what you need to build it. First measure the inside dimensions of the pickup bed. Measure the narrowest distances of the length and width of the inside of the bed so that final assembly can be lifted in and out of the truck bed. If the bed has wheel wells in it, the lower side boards will be mounted above them. Cut four 2 x 6s the length of the bed and four the width of the bed. 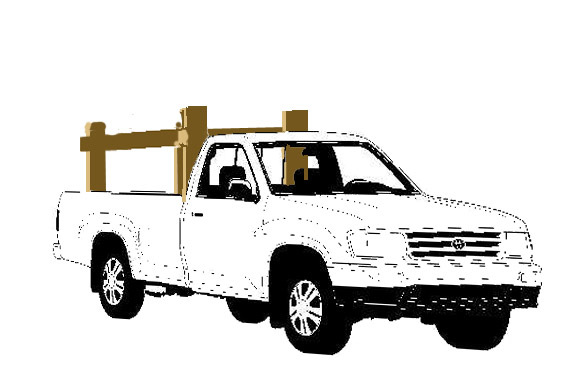 measure the height from the bed of the pickup to the top of the cab. Add 12 inches and cut 4 boards that length to act as uprights. Assemble the ends first. 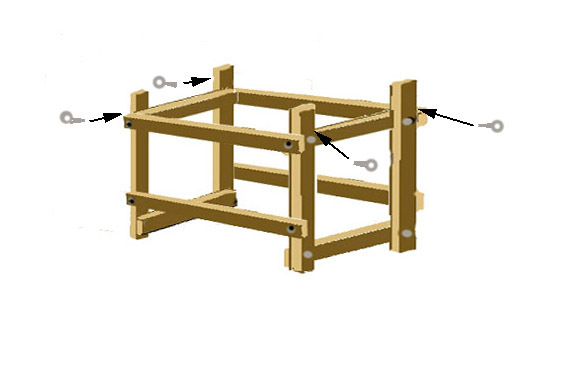 Lay out two legs and clamp a 2 x 6 cross member (width of the bed) so the top edges are 4 inches below the top of the legs. Drill half inch holes and bolt the cross members in place with the carriage bolts, nuts toward the inside of the frame. Note the cross members will be oriented toward the inside of the bed. Clamp the second cross member in place at the bottom of the legs and bolt it in place. Repeat with the other legs to make two rectangles. Set the legs up with the cross members toward the inside of the truck bed. 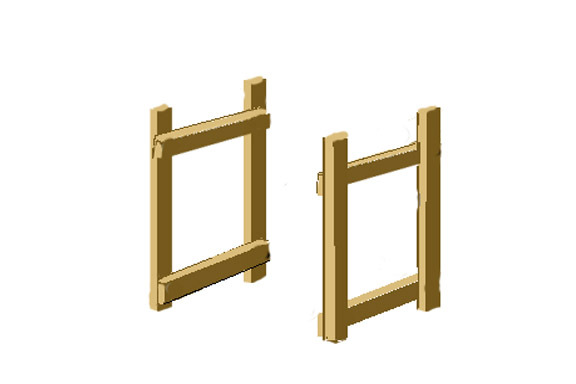 Clamp the long side boards to the sides of the legs at the top, even with the cross members. Drill a half inch hole through the side boards into the ends of the cross member. Be careful not to drill into the carriage bolts. Lag bolt the side boards to the sides of the legs. Lag bolt the second side board to the side of the legs so the bottom of the board is a half inch higher than the top of the wheel well. Repeat on the opposite side. 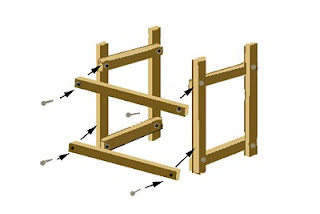 Add screws at every joint to stiffen the frame and strengthen the attachment. Wrap carpet strips across the top of the cross members to pad the frame when carrying things. Staple the carpet strips at the bottom to hold them in place. Drill and attach eye screws to the front and back of the end frames at the top to act as tie-downs. When you need to use it, simply lift the frame into the back of the truck, attach bungee cords or ratcheting tie-downs between the eye bolts and the truck bed to hold the frame in place. Now, you're ready go. It allows you to carry long or bulky things without them sticking out the back or resting on the cab. When you're done with it, you can get a helper, drop the tailgate and lift it out. It takes only a couple of hours to cut out and assemble the pieces. Chris Wheaton sent me a photograph of the rack he built from these plans. As you can see from the picture, the frame is sturdy and leaves plenty of room underneath for paddles, life jackets, camping and fishing gear. Thanks for sending these along, Chris. Note the hooks on the inside of the legs for fishing poles and paddles. 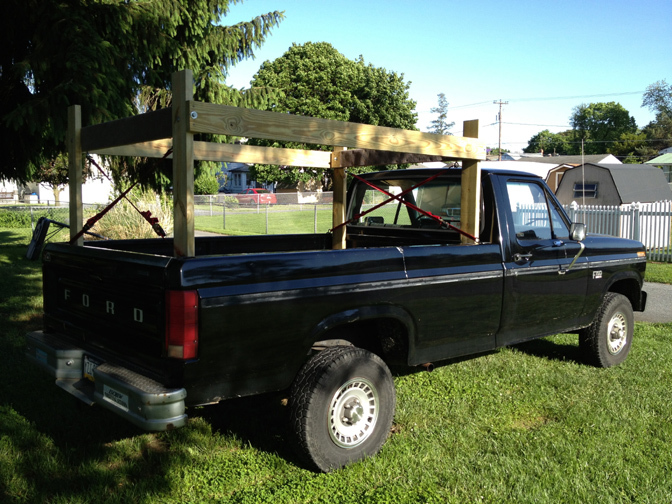 Chris wrote this comment about his version of this wooden canoe/ladder rack shown above. Scott sent me the pictures below with this note, "Thanks for the great plans. Built this over Memorial Day weekend. Very happy with the results - though it is HEAVY! That's okay, I'd rather err on the side of over-built anyhow." Scott screwed some eyebolts into the frame for holding his bungees. In a pinch you could nest a couple of kayaks up there too. Very nice work there, Scott. Thanks for sharing. It certainly is not a light frame, but if you're hauling boats, you want everything to be solid - especially if you'll be using this around kids, which is where this came from. You could haul a couple of boats, tents and a ton of gear for a youth campout with this rig and the boats help keep the water off your gear if it rains. Thanks again for the truck rack design; I had lots of fun building it this weekend for my new F-150. I made a few design modifications in order to make it portable for one man to handle. My design is a knock-apart system and it requires no tools to install or remove the rack. 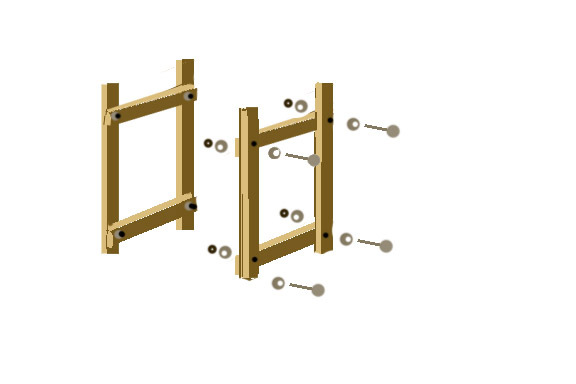 The rack system consists of six pieces which can be effortlessly assembled/disassembled. The front and rear frames are one-piece rectangular assemblies while the four side rails detach easily. I used 1/2" threaded bar through the uprights with a nylon locknut/washer on the outboard side and a wingnut/lock washer on the inboard side. I added 2" PVC pipe to the top of the front and rear frames to make loading and unloading a breeze. Just bore the pipe and screw with 3-1/2" exterior decking screws. This system carried several construction staging planks without making a squeak! Notice the padding on the top rails. They are easy to make with a good sharp knife and some of those open cell foam "noodles" the kids play with in the pool - just cut a channel in one and slip it over the edge of the board. You can see how the wingnuts let you to remove the long boards leaving just the two end frames to lift in and out. It's quick with the wingnuts. You can store the whole thing against a wall in the garage and assemble it in minutes when you need it. Here's a closeup of the wingnuts. A long drill, but doable with a long bit. Here's the lower long support member wingnutted (is that even a word) into place. Here's a version built by Kevin Leroy Froese that maintains stability by raising the lower lengthwise supports above the wheel wells. Looks great! Kevin is using the rack to carry his fishing boat. Perfect! Thank you. I was looking for a do-it-yourself project, and wasn't keen on spending $400 for a ladder rack for my canoe. Thanks - I hope to build this next week. I definitely like the price of this versus what I'd have to spend on a new rack. 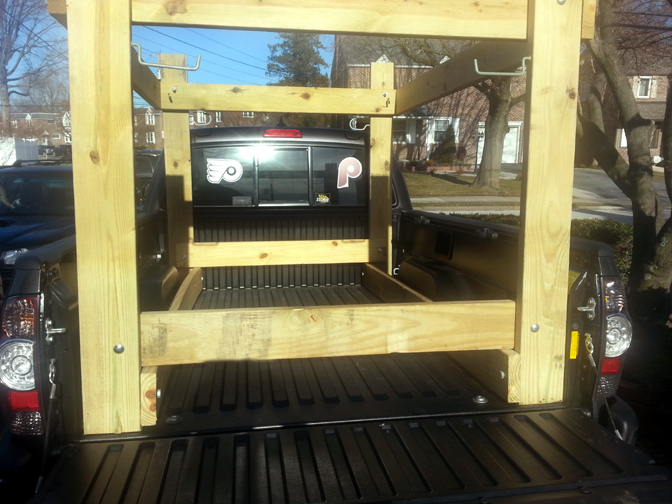 It works as a low cost solution if you don't want to attach something permanent to you truck. Also, if you set it up on blocks when you're not using it, you've got an instant backyard canoe rack. Great site. 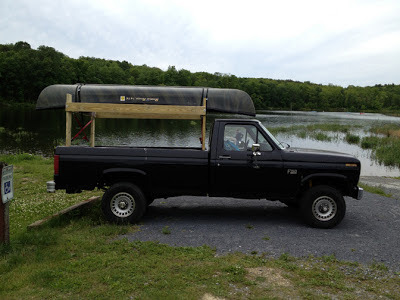 Built this for a canoe trip and it worked perfectly - a few small adjustments for my specific truck but the basic layout was clutch in getting this started for me. This will last for years to come as well. If you'd like to share a pictuer of your completed project, I'd love to post it on the blog. It helps to see the actual completed rack. It's been a while since I had mine. The pic can be e-mailed to me a twayneking@gmail.com. Thanks for the great instructions and illustrations. 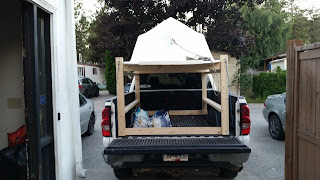 My Husband and I just bought a canoe for my 11yr old Scout and was looking for an inexpensive way to make a rack for the truck. We are not carpenters but this is pretty straight forward with few tools needed. If you set it on blocks when you take it out of the pickup, it can work as a backyard canoe rack. It works just fine made out of 2 by 4's and it's lighter for lifting in and out of the pickup. I always over-engineer when I'm working with kids, though. They like to climb on things. I built one a few years ago using 2x4's for weight reasons. The end panels are rigid but the side rails attach to the end panels with clevis pins so it can be easily disassembled for storage in the garage or in the bed of the truck. The specific designs of such racks can vary depending on the type of vehicle, the location at which the canoe will be secured to the vehicle, and how many boats must be transported. Worked out well, except I decided at my age (71) a rig made out of pressure treated 4x6es would be too heavy to lift in and out, so I went with regular lumber with 2x4 uprights and water sealed it. Thanks for the plans! I'd like a picture of the lighter frame, Hawk. If you take one, please send it to me and I'll post it (twayneking@gmail.com). I don't blame you for making it lighter. The 2x6 rig is for a younger dude. And you can always spray the frame down with Thompson's water seal. It's a lighter weight solution for protecting the wood. Me, I use six to eight 15 year-old boys for loading and unloading the rig. Scott, I changed the number of 2 by 6's. You'll be cutting these to size and should get two pieces out of each. If your truck is particularly wide you might get four 10' 2x6's. As to the galvanized screws, I screw them into the ends of the cross members, so the extra half inch runs into the cross members lengthwise so the length of the screw isn't a problem (it would have to be a 5 foot long screw to get out the other side) and I like the added strength. 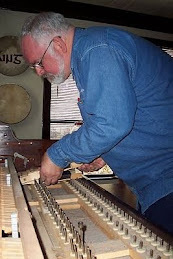 Be sure and predrill the holes so the wood doesn't split, though. Anywhere a screw could poke through, I put bolts all the way through. Everybody must be getting ready for canoe season. I've seen a lot of traffic to this How-to lately. Yup, looking at carrying around 2 12ft kayaks and possible 2 mt bikes. This may come in handy! Hey Tom! 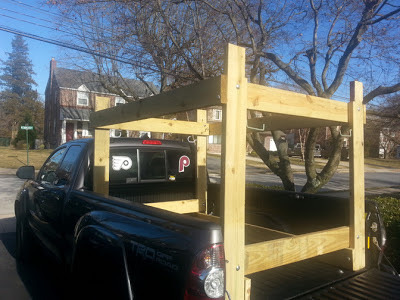 I just bought a new Ford F-150 and was looking for a rack design I could build that would be portable (the wife doesn't want to see the racks on when not in use!). I like the idea of the 2x4 lightweight version as I am usually working alone. I'm a carpenter by trade and love teaching the kids at the vocational high school. All my life I've had to dabble in whatever I need to survive(automotive, electrical, plumbing, etc.). Although God hasn't seen fit to bless me with money and materialism, I get much joy out of being a do-it-yourselfer, especially when I can share my skills with others. I guess you might say God has blessed me with talents that I can use to support myself and also to bless others with. Thanks for the plans. Great site. 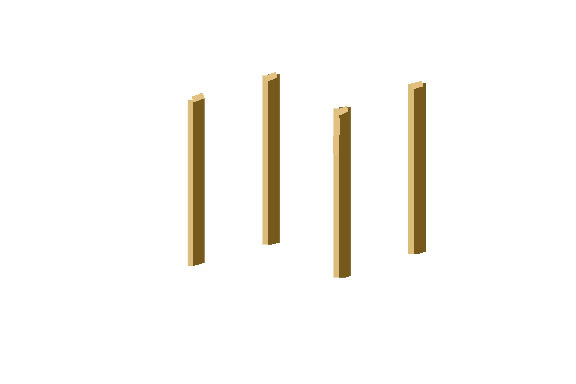 I have a question....on the illustration, the bottom long pieces are shown on the outside, but on the photo, the bottom ones are on the inside, and the top on the outside. Will it make a difference? It really doesn't make a difference. It's such a simple design, you can move them around to suit yourself. Either way works. This is a great idea! I don't need a lumber rack often but when I do, I do. I love the wing nut idea so I can break it down to store in the garage. I'm rebuilding my mother-in-law's patio roof next week so this will come in very handy with little expense. Thanks so much!!!!!! That is cool. I was only disappointed because I read it wrong. I wanted to build a canoe! I'll put up canoe building plans as soon as possible. Hey do you think it's possible to put a 14' aluminum boat on this? Or would that be un-aerodynamic? Also any ideas on making it easier to put the boat up there? 1. Back the truck up to the bow of the upside down boat. 2. Lift the bow of the upside down boat onto the back end of the rack. Set the bow down so that the front of the boat is well supported on the cross member. 3. Lift the rear of the boat and push the boat forward so that it slides up onto the rack. Keep the stern of the boat low until the nose of the boat is far enough forward to lower onto the front cross member of the rack. 4. Slide the boat into place and tie it down just like you would a canoe or anything else. Getting it up on the boat is all about leverage. There's no need to lift more than half the boat's weight at a time. Do it this way, even if you have two or more people to protect yourselves from back strain and smashed toes. I've seen people carry John boats on racks like this. Good luck. I am buying my family a set of kayaks for Christmas. I have them picked out already. I am struggling to find a great car top rack to carry them in. Is there a brand that is superior to others? Glad to hear it went well. Would love to see a picture. great post. great thread. I just got a 11.3 foot jon boat. weighs about 240 lbs. think this setup would hold that kind of weight down the highway? Why not? Check the bottom picture. Kevin uses the one he built to carry his jon boat. That's how it looks on top of the rack. Awesome! much appreciated. Will tackle the project this weekend. You sir are a class act. Thank you for the prompt response. Great instructions! Question, I need a rig to take 2 canoes. If I put the top beams so they are flush on the uprights would this rig still work? Sure, you could make them flush. You want to might add some overhang to the side to make it wide enough for two canoes. can i post pics of my canoe rack build? You bet. Send it to me at twayneking @ gmail.com and I will post it (take out the spaces - I do that to fend off the evil address gathering spam robots). Thanks. I look forward to seeing it. I just built this using 2x4's and it works great. I opted for making the top bar flush with overhang so I can get a couple kayaks up there. The eyebolts only came in packs of 10 so I added three on each top bar for tie downs. Send me a picture and I'd be happy to post it along with the others up there. Glad to hear you guys were able to build it out of salvaged materials.